The word "yoga" has varied connotations; to some it may evoke images of grim ascetics in far-off mountain caves, pushing the limits of human tolerance of austerity. To others, yoga is a household word, a label for some of the many forms of holistic exercise available on the market. Some are familiar with the practice of yoga but are only dimly aware of the philosophy behind its practice. Still more people have no idea what it means at all. Until the late twentieth century, yoga was hardly discussed or practiced outside India, where—according to traditional wisdom—human beings have been practicing some form of yoga or another since before recorded history; before there were supposed to have been human beings at all. When His Divine Grace A.C. Bhaktivedanta Swami Prabhupada began teaching the Bhagavad-gita to New York audiences in 1966, he saw the need to relieve his listeners of some popular misconceptions of yoga circulating at the time (which nevertheless continue to circulate). 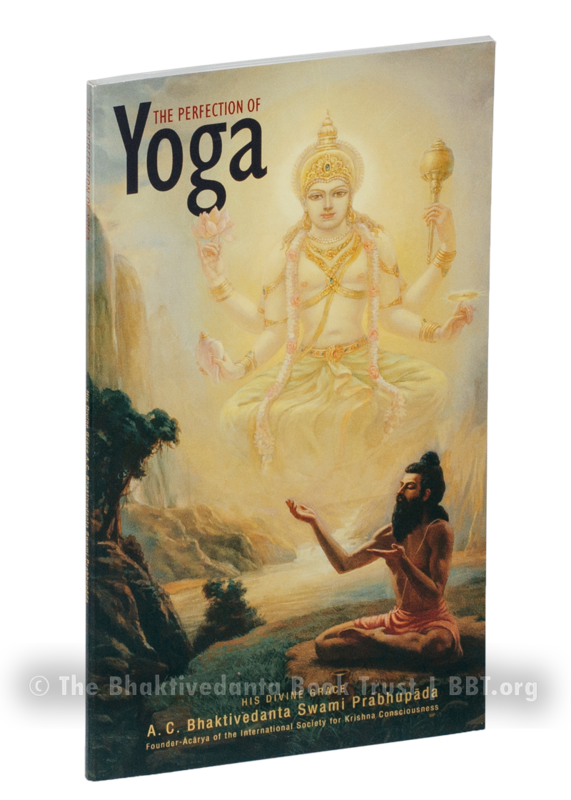 The point of yoga, he explained, is not to get a good body, increase longevity, or even to "become one" with the formless totality of all energy; there's a lot more to it than that. In the Bhagavad-gita—the central and foundational text of all Vedic wisdom—Krishna concisely explains the actual essence of yoga. There are varieties of yoga practice—intellectual, physical, devotional—but the ultimate goal of all yoga is one (an extremely lofty one); "union with God." Krishna, speaking with the voice of authority as the Absolute Truth in person, gives His final opinion on the matter (Bg. 6.47): "And of all yogis, he who meditates on Me within himself and worships Me with devotion and faith is the highest of all." The Perfection of Yoga is an edited compilation of some of Srila Prabhupada's earliest recorded talks on the Bhagavad-gita in New York City in 1966. Drawing upon his knowledge of not only the Gita but the whole Vedic tradition, he reminds us of some essential truths about ourselves that the human race has forgotten for a very, very long time. Such truths, when brought to bear in our daily lives, can invest our human experience with a degree of peace and purpose that is rarely even imagined.